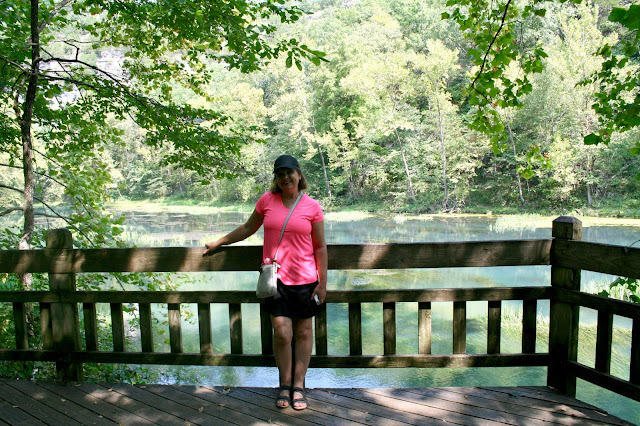 Now that the Holiday Season is over, I can get back to a regular blogging schedule and continue with my Missouri Travel Posts. My husband and I took a vacation to Missouri last September. We spent most of the week hiking in state parks. 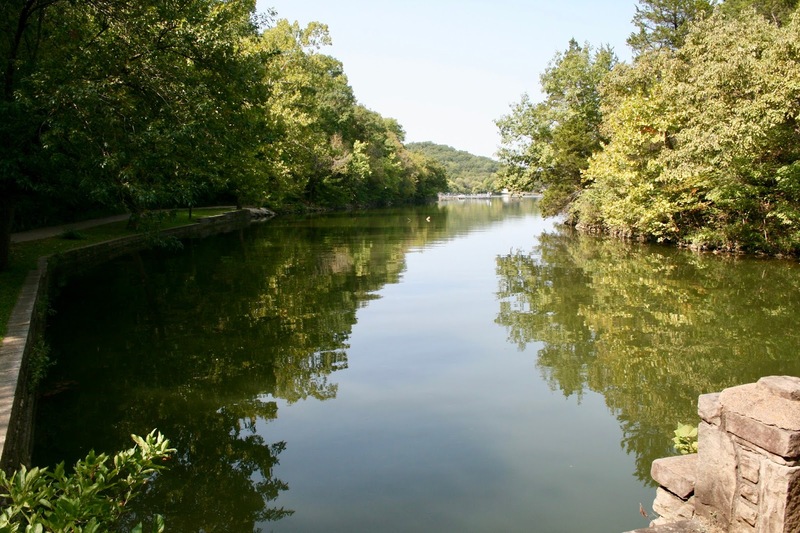 We went to six different Missouri State Parks, and Ha Ha Tonka was by far our favorite. It was such a large, and interesting park that I divided that park into two separate travel posts. If you missed Ha Ha Tonka State Park, Part One you catch up HERE. 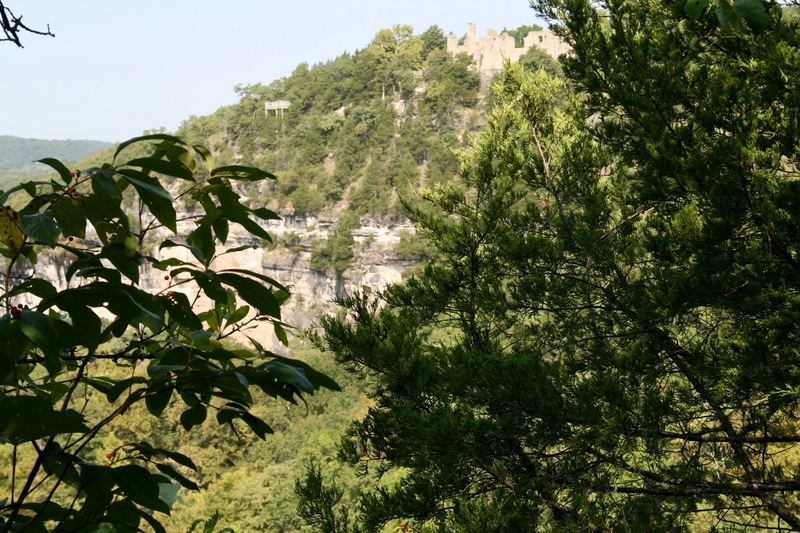 In my first post, I covered the castle ruins, the Castle Ruins Trail, and the top half of the Dell Rim Trail. You can see the castle ruins in the top center right of the picture below. It almost looks like its a part of the cliff doesn't it? The picture really gives perspective to the height and size of the castle. This picture was taken from one of the lower trails. After hiking the upper portion of the Dells Rim Trail, we proceeded down to the Colosseum Trail. 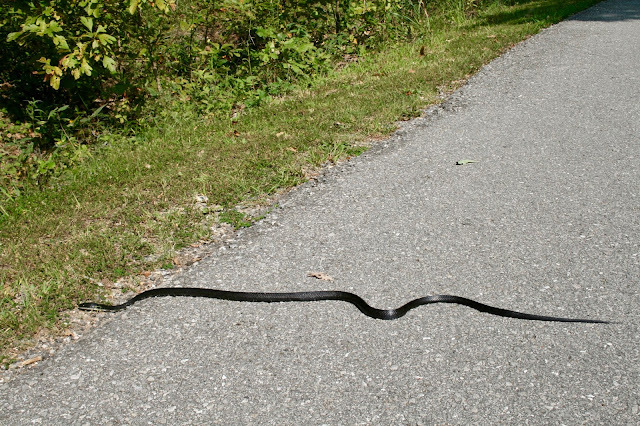 On the way there, we spotted this large black snake. Not being familiar with Missouri snakes, I kept my distance. But my husband of course had to get close for a picture. I just had to walk away. I couldn't even watch. He is always making nervous pushing the envelope to get a picture. 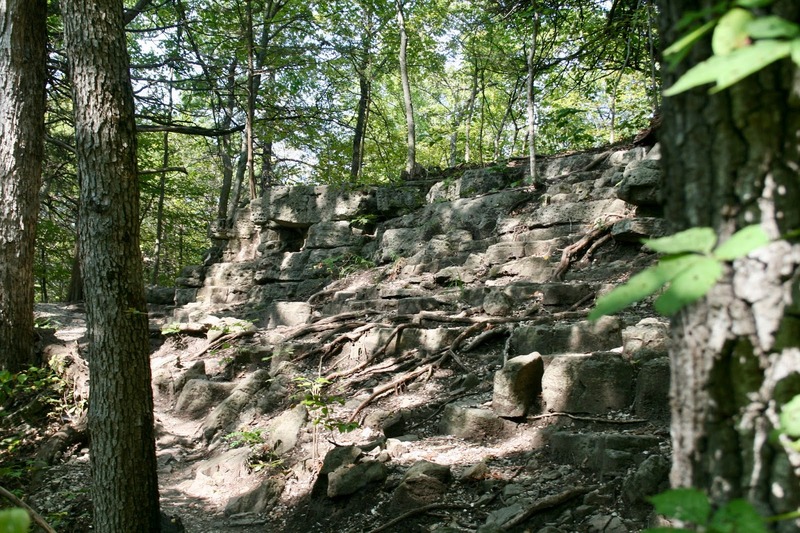 The Colosseum Trail is a 0.70 mile loop. 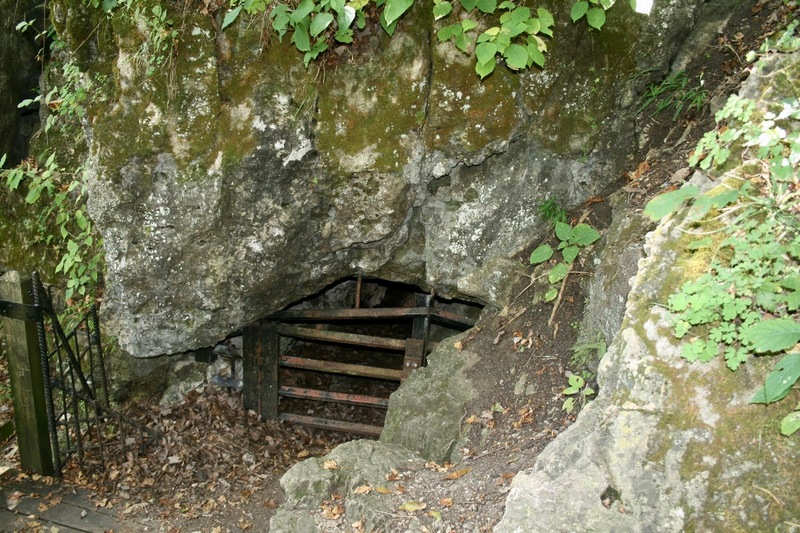 It is a natural trail that winds under a natural bridge and through a large sinkhole, the "Colosseum". 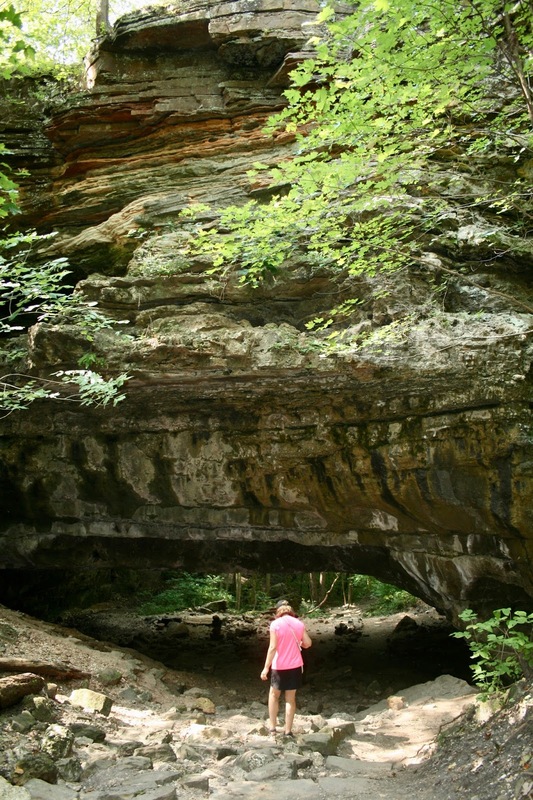 Below is a picture of the natural bridge. 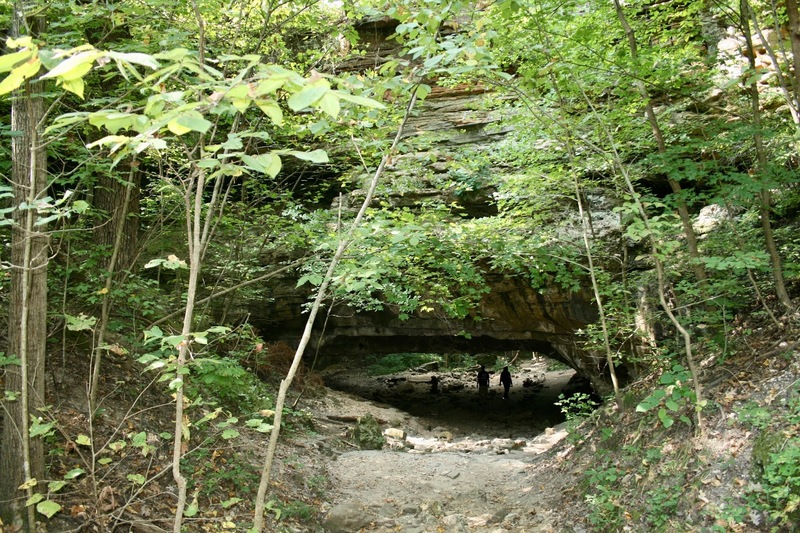 It is a massive stone arch left behind when the cave system around it collapsed. It spans 60 feet, is 100 feet high, and 70 feet wide. You have to walk right under the bridge to stay on the trail. I couldn't believe the temperature difference underneath the bridge. I absolutely loved this trail. It was so peaceful and serene. Perhaps the most enchanting thing about it was that I heard so many insect and bird noises I had never heard before. I felt like I was in the magical Fern Gully forest. 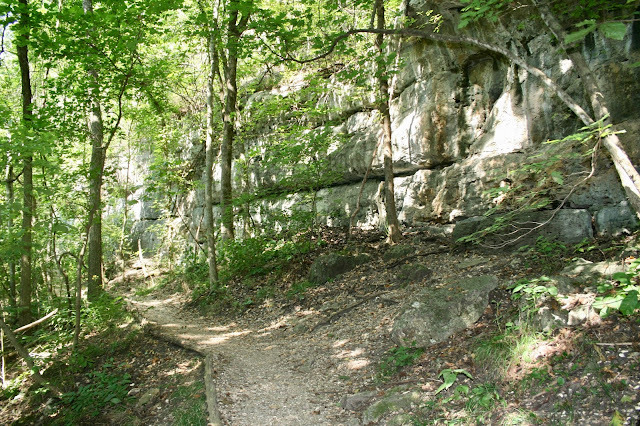 A lot of the trail takes you past some very impressive rock formations. Now here is my biggest tip if you are ever blessed enough to visit this park: Drive to the top of the park and park your car near the Castle Ruins and walk down! 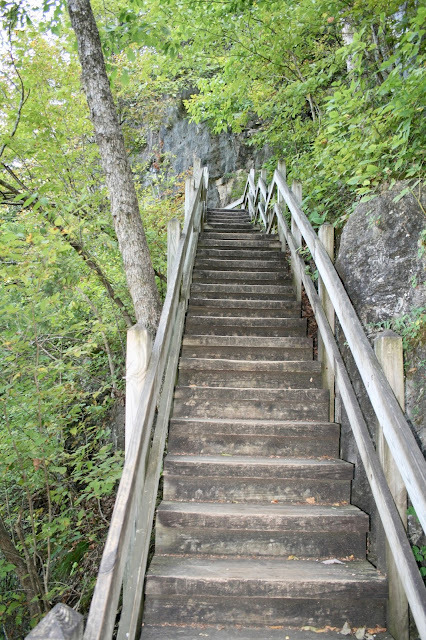 We saw a lot of exhausted hikers climbing up all these steps, and trust me, it's a lot more enjoyable to walk down the steps and not up. 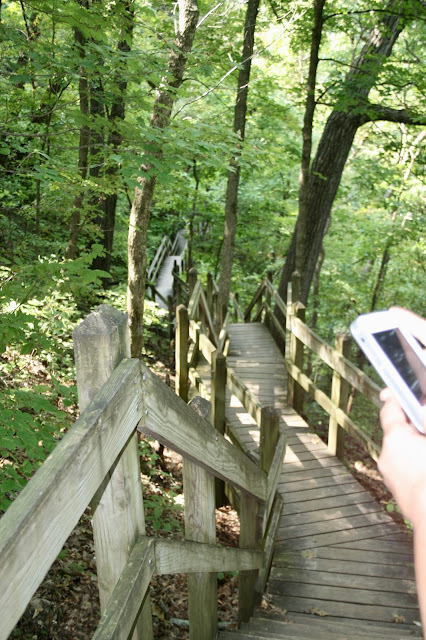 Yes, you have to walk back up eventually to get to your car, but you can take "Connector Trails" which make the hike back easier and quicker. When we finished the Colosseum Trail Loop we connected back on to the Dells Rim Trail which I covered in my previous post. This part of the trail however goes down into the Whispering Dell Sinkhole. 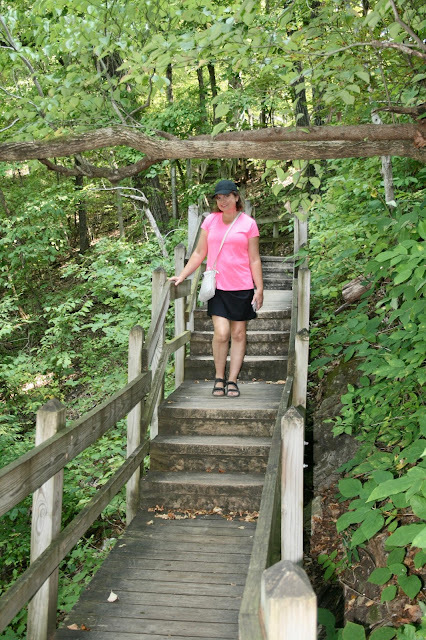 This trail has 316 wooden steps down to Ha Ha Tonka Spring (see why you want to start at the top and walk down?). There are even more steps after Whispering Dell to the second overlook which are steep and can be difficult for some hikers. Steps, steps, everywhere. They are built right along large rock formations and take you down, down, down to a magical wonderland. When we got to the first overlook I was awestruck with the blue color of the water. It was so peaceful. The wildlife was amazing! We saw fish, turtles, and so many birds. I felt I was in heaven! 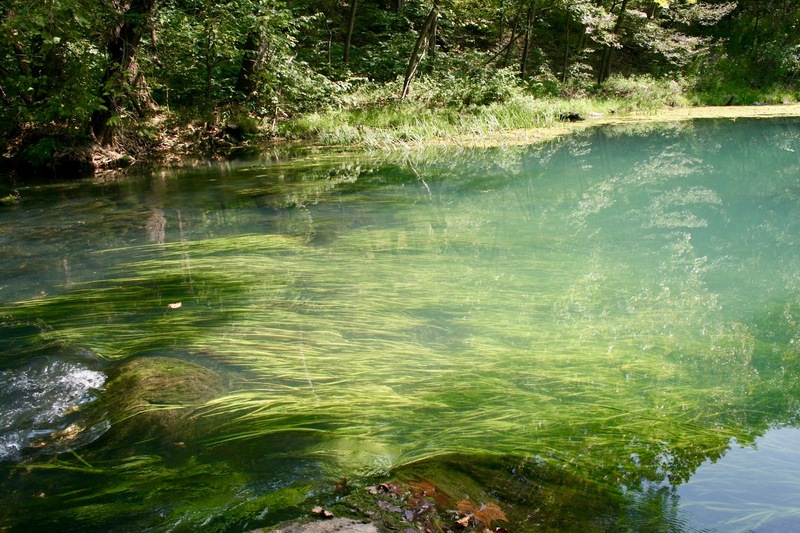 The reason the water is so blue is because it is a spring. It emerges right here; a water-filled cave at the base of a small bluff. 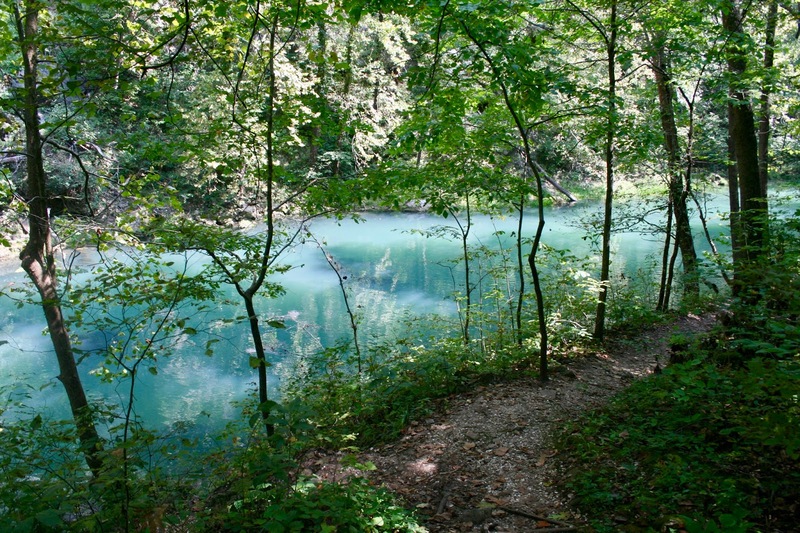 At this point, the trail levels off and it is just a nice, peaceful stroll along the most blue water I have ever seen in my life. 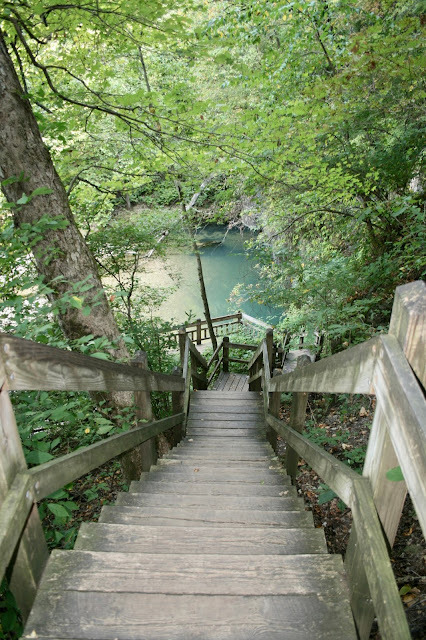 When you get to the bottom of the steps, to the sinkhole, you are now on Spring Trail. 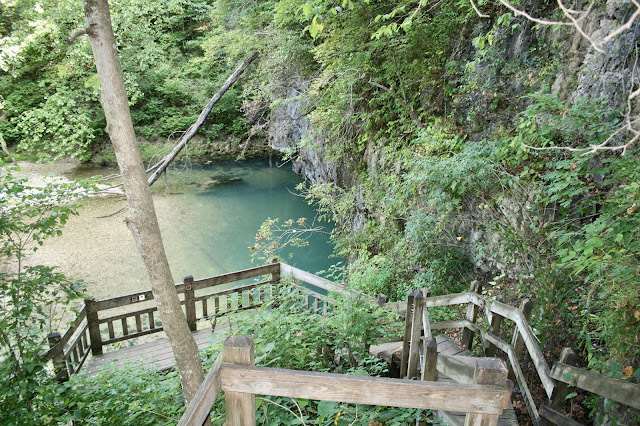 It is 1.50 mile loop that follows the shoreline of Lake of the Ozarks and Ha Ha Tonka Spring. 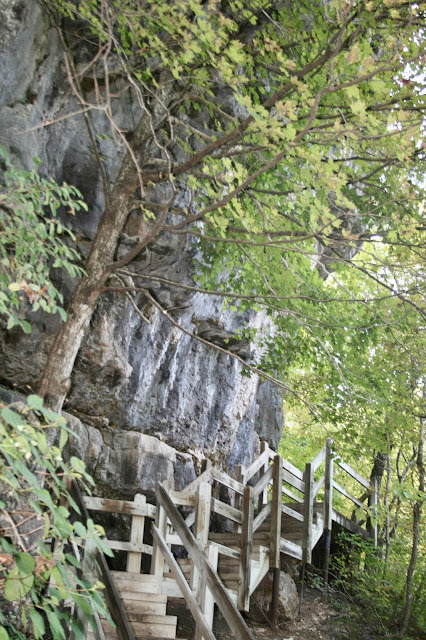 The trail squeezes between large rocks that were once part of the ceiling over this collapsed chasm. The Spring Trail was my absolute favorite trail in this park. If you can only go on one trail, I recommend this one. It was perhaps one of the most beautiful natural places I've ever been in my life. The water was so clear you could see right to the bottom. There were so many fish! This is the second overlook. Can I just build a house right here and live here forever? After the Spring Trail we connected to the Island Trail. 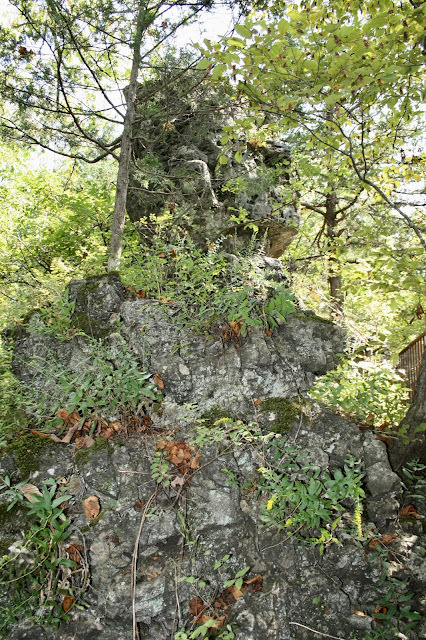 It is a 0.50 mile loop onto an island where there is a Balanced Rock, cave, and the confluence of Ha Ha Tonka Spring and Lake of the Ozarks. Here is the Balanced Rock: a large cylinder-shaped dolomite boulder sitting on one end. Again, can I repeat how BLUE the water was? My goodness, I've never seen such blue water in my life. Pure, unadulterated beauty! We even caught a white crane taking off in flight as we approached this area. It was such a beautiful sight. 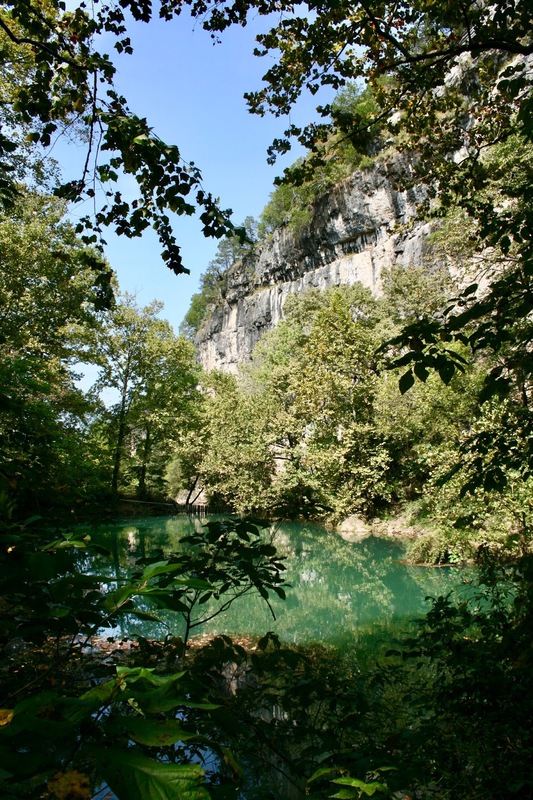 The spring and lake are further enhanced by the large bluffs looming above. 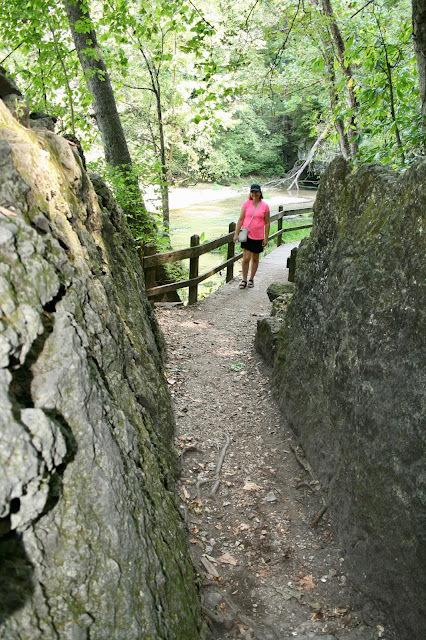 The trail follows the spring channel to a small breached dam where the spring water runs over large boulders. So, so pretty! We could walk out onto the boulders a bit. The algae growing on the rocks was so gorgeous. And finally the Island Cave. It is gated off, so all you can do is peek inside. This park was so vast and so spectacular, we wished we would have planned two days to explore it more. There were still so many more trails we wanted to take, but by now we were exhausted and hungry and knew it was time to leave. We took the White Connector 2 Trail back which cut out having to climb all those steps back to the top. Next week I will continue with my Missouri Vacation with our next and final stop: Branson! Thank you! It was such a magical place. Bryce Canyon is on my bucket list too! I've been to Arches National Park, but there are so many other parks in Utah I want to go to. That state is amazing! What a beautiful park! The bright blue water is just gorgeous! 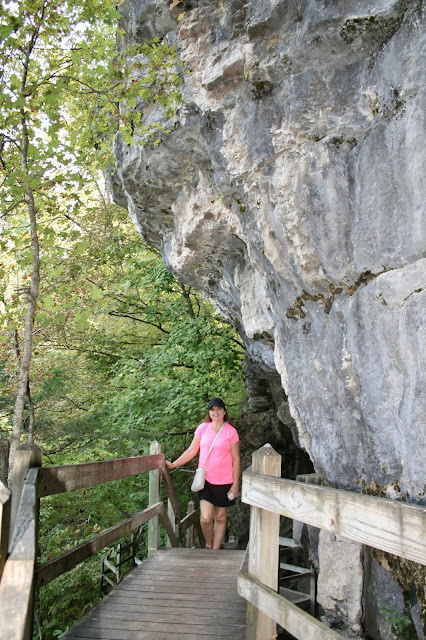 And I loved seeing the rock formations! Thanks Laura! It was gorgeous! Sounds like a great place to go! 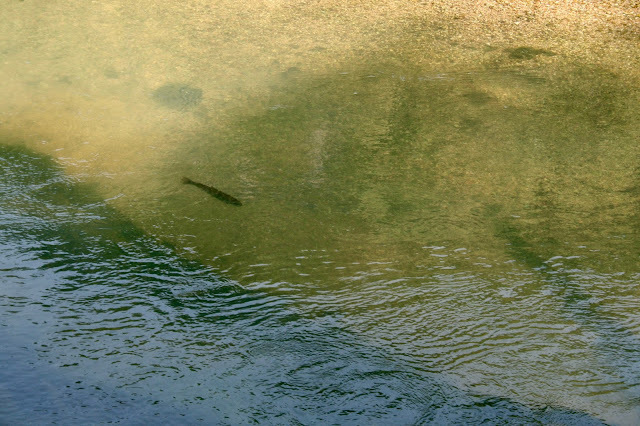 The snake and the fish are pretty cool! I'm in Missouri and I've never been here, but this would be a fun place to check out with my husband. I can't believe how blue the water is, you can really tell in the photo! Oh Carrie, you definitely need to go here! You will love it! What a beautiful park, but that snake would have me running LOL. 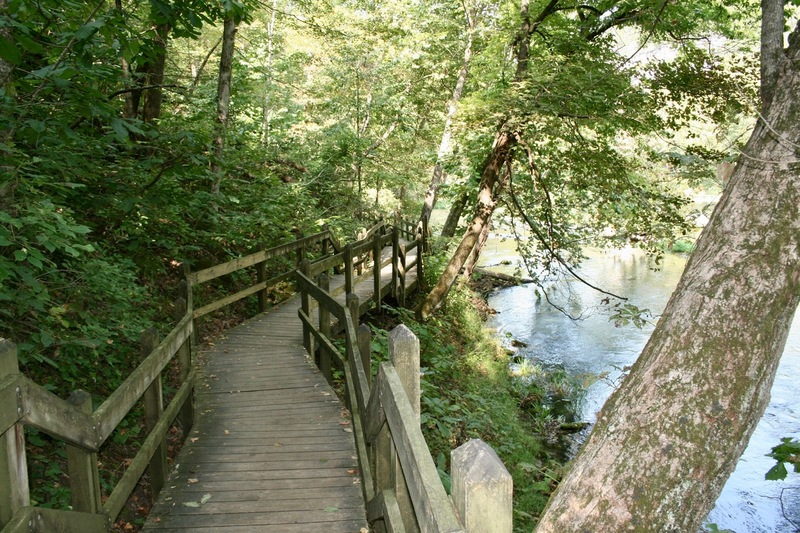 I accidentally stepped on a small snake at an Iowa State Park a loooong time ago, I got so scared, almost fell off a cliff. 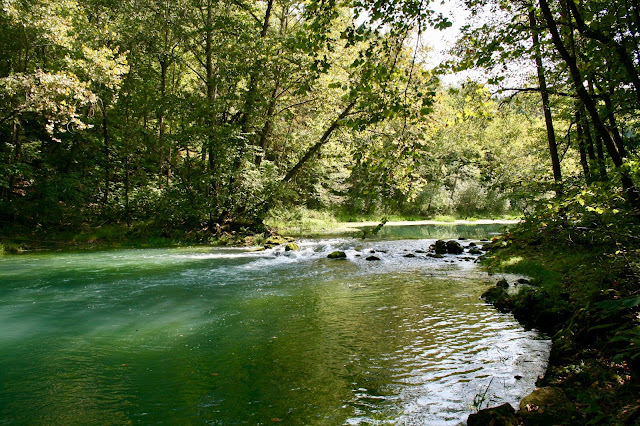 But love that gorgeous blue water and amazing views, definitely a place to visit if we go to Missouri again. Thanks Elli! Yes, I headed in the opposite direction of the snake too! Wow! That must have been a scary experience in Iowa! What a delightful place to explore, Amy (despite the snakes, which we are used to here in Australia...). I'd love to visit it one day!